Heat the olive oil and vegetable oil in a small saucepan set over low heat, add the unpeeled garlic cloves and chiles de arbol and let them cook for 8 to 10 minutes. The oils should be gently bubbling. Remove from heat and add in the fresh oregano leaves. Set aside to cool slightly. With a slotted spoon, remove the garlic cloves from the oil and, when cool enough to handle, peel off their skin. Place them into the jar of a blender along with the oils, chiles de arbol, oregano leaves, vinegar, mustard and salt. Puree until completely smooth. Scrape into a bowl and set the vinaigrette aside. Place a saute pan over medium-low heat. Once hot, add the walnuts and toast for 2 to 3 minutes, stirring as they begin to lightly brown. Remove from the heat, let cool and chop. Incorporate the chopped walnuts and dates into the vinaigrette, toss and let sit. You can make the vinaigrette 12 hours ahead of time. Stir before using. 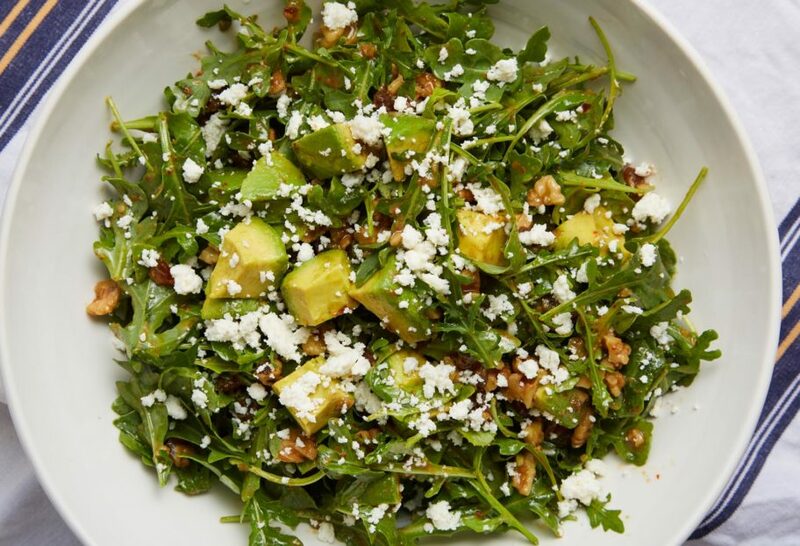 In a salad bowl, toss the arugula with the vinaigrette. Top with avocado chunks and queso fresco. Serve. My favorite part about this salad is the way the dressing comes together! I make salad dressing all the time, but I rarely heat my ingredients and have never ever used chile de arbol in the vinaigrette. Blending the ingredients emulsified everything so nicely. I served it at a family BBQ and even people who don’t usually eat salad served themselves twice! Thank you Pati for another delicious recipe. Loved to hear this, Leila! Thank you. This salad was beyond delicious. My dinner guests couldn’t stop raving about it. I can’t wait to make more of your recipes Pati. Thank you. So happy to hear that, John! And I’m glad your dinner went well. Wow. That salad looks amazing Pati! Thank you much for sharing. Btw …. I love your show – keep up the great work! !